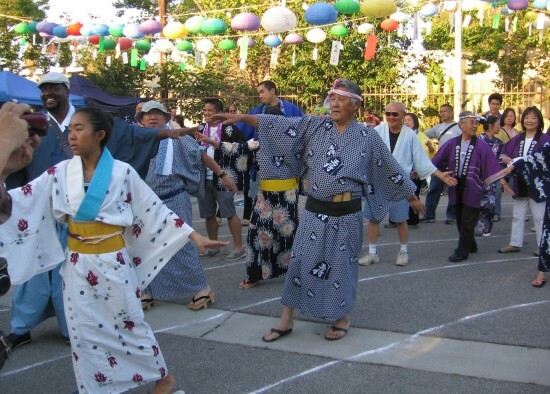 Senshin Buddhist Temple will hold its annual Bon Odori on Saturday, July 6, from 7 to 9 p.m.
Hatsubon service with Rev. Kakuryu Kodani, for those who have passed away since the last Obon, will be held at 5:30 p.m., followed by otoki at 6:30 p.m. The evening’s activities will also include a raffle drawing at 8:30 p.m., hondou omairi (offering incense in the main hall), sentou shougon (1,000 memorial lamps), and otoki at 9:30 p.m., and houraku by Kinnara Taiko and others at 10 p.m. The temple is located at 1311 W. 37th St. (between Normandie and Raymond) in Los Angeles. For more information, call (323) 731-4617, email [email protected] or visit www.senshintemple.org/. The temple provides the following explanation of Obon. “In Jodoshinshu, Obon is called Kangi-e, or the Gathering of Joy. It is the major festival of our Buddhist calendar year. It is a memorial service and celebration in memory of our ancestors and all who have died, an occasion to remember our indebtedness to all who have gone before us, to appreciate and thank those lives and to reaffirm the sanctity of all living things. “In order to have this appreciation, we are called to the Obon gathering to dance, however embarrassed or however boastfully, so that in the meditation of dancing, we can momentarily forget the self. It is at this moment that we suddenly remember our indebtedness to others and truly dance joyfully — happiness is the ego getting its way, joy is being free of ego. “To truly dance Bon Odori is to be truly connected. It must be done without a calculating mind, without a mind needing to always be in control. It is ‘just dancing’ in its purest form — without guile, without pretense, without embarrassment, without ego asserting itself in any direction. We invite you to connect with each other and all things living and dead in this Gathering of Joy.